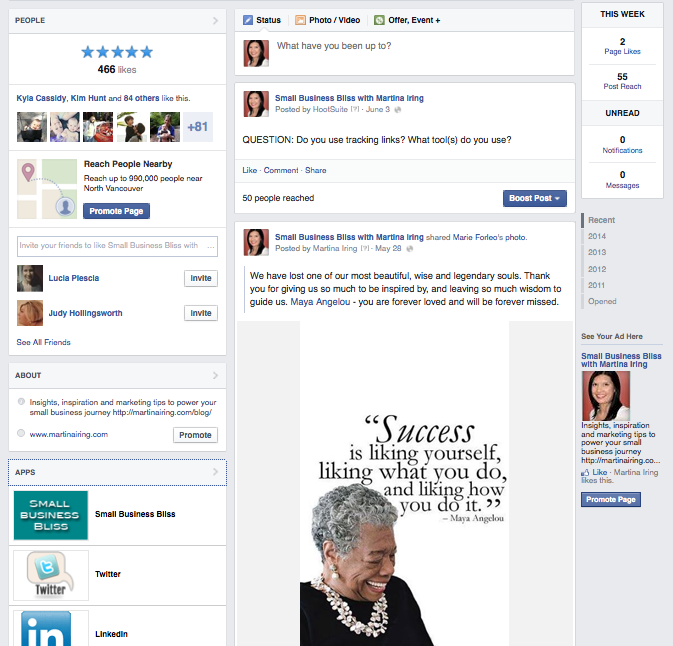 Time for another facelift to your Facebook business page! The new Facebook design brings changes that are mostly visual and layout related, all with the goal of making things easier for its users, according to Facebook. While many pages have access to the new design now, it will officially roll out to all users on June 13, 2014. The header part of your page will see a few changes. 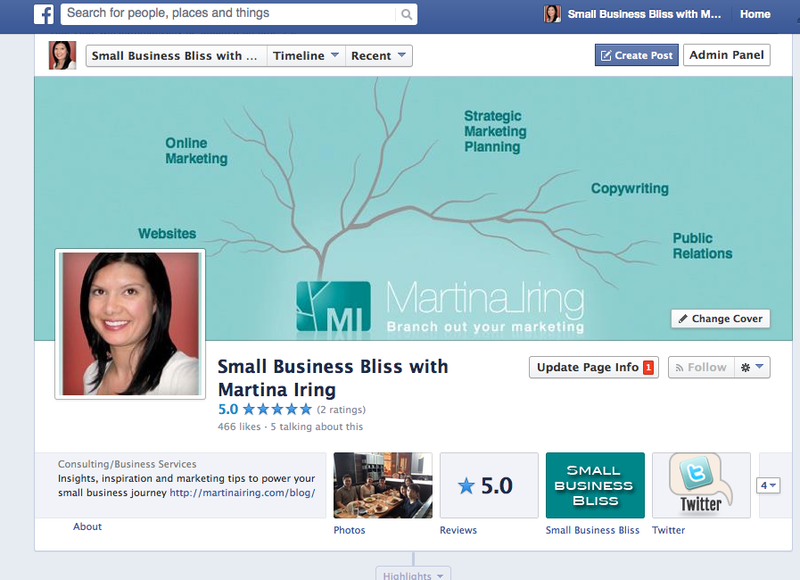 The “like” button for your page has moved into the header. If your image design involved an arrow towards your like button or had anything in the bottom right corner that is now covered by the new buttons, you will need to change up your design. The other element that has moved over your cover image is your page name and the category of your business. So it may cover up important parts of your graphic or not look quite right – as you can see with mine below, I will need to adjust it. Also, you will see that all of your About information and your tabs, which used to sit right at the top, is now in a left hand side bar (see below for more on this new area). The new Activity tab houses your notifications, messages and your scheduled posts (or activity log). Settings is where you make edits to your page. To the right of your header is where you will find your new notifications and messages at a glance. There is also a new set of navigation at the top of your page under your cover image. You can change the order of the elements here. Click on “More” and then “Manage Tabs” at the very end. You cannot move “About” but otherwise you can choose which 2 other elements will be visible in your navigation without needing to click “More”. 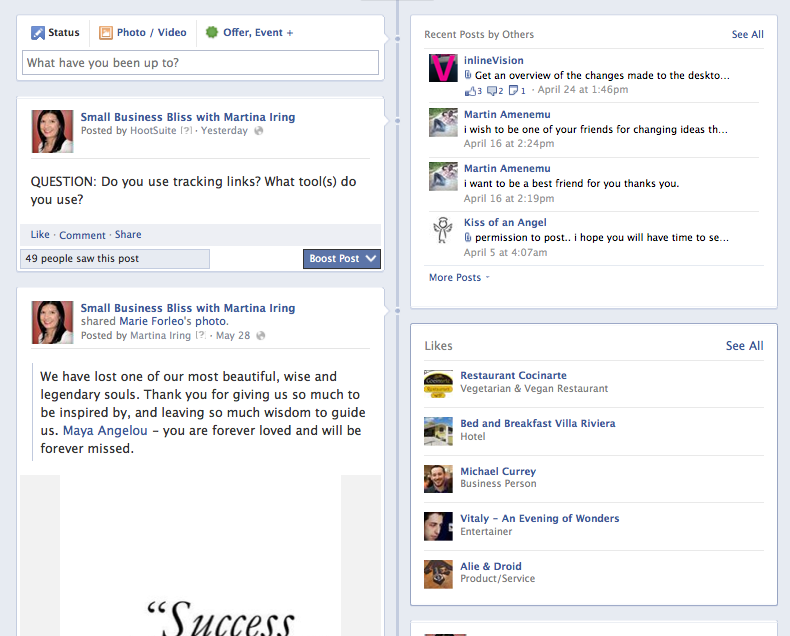 Your page will now have a right orientation, where you do all your activity from the right hand newsfeed. As I mentioned already, there is now a left hand side bar, which now also includes the posts to your page, your likes and your About section. With the About section, the new design includes an official link to your website. So rather than having to fit your website URL into the description, you now have a few more characters to make your blurb a little longer if you like. Your apps are now also on the left hand side (in addition to the navigation area discussed above), farther down and less prominent than they used to be when they were right at the top of your page with an image icon. According to Facebook, you should be able to change the order of these, so that you can choose the ones that you want to highlight. I’m not able to do this yet on my page, so I imagine that this functionality will be coming soon. You will also see that your photos are more prominent with the new design. Rather than just showing the latest photo, you can now see the last 9 photos posted to the page. The highlight a post function no longer really serves to do anything with the new layout. So you will just have to stick with pinning your most important posts to the top of your page.